Hey there! 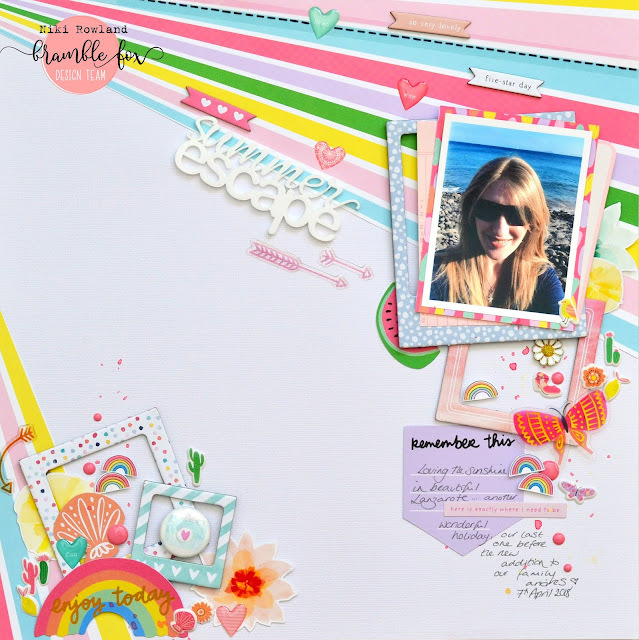 I'm sharing a layout today for Bramblefox using the Summer Escape Perspextive from the June Fox Box. I loved this title so much as it could be used for lots of different things. I've used it for a holiday photo but it could be used for any day trip, or even a summer's afternoon in the garden! I've used the Sunshine & Good Times collection by Amy Tangerine. I cut the paper and used it to add features to a white background and I layered up lots of frames and ephemera to create the two clusters. Head over to the Bramblefox Store to pick up lots of lovely Perspextives as well as signing yourself up for a Fox Box!